Few garden flowers can match the cheerful appearance of the pansy (Viola x Wittrockiana), with its central blotches that give it a "smiley-face" look. A modern hybrid developed from wild flowers that were traditionally regarded as remembrances of love, the pansy is an easy-to-grow plant that thrives and blooms best in cool weather. With a bit of extra care, you can prolong its bloom and might also see flowers during several seasons, depending on the climate where you live. Pansies have five petals and come in many colors. Pansies are grown as annuals in colder portions of the United States, but they also grow year-round outdoors in U.S. Department of Agriculture plant hardiness zones 7 through 10. They prefer cool temperatures, which are best for flower production; ideal temperatures are about 40 degrees Fahrenheit at night and in the 60s during the day. When planted in the spring as annuals, the plants produce abundant flowers for several weeks or until warm summer days arrive, when they slow their growth and produce few new buds. If you live where winters are warm and subfreezing temperatures rarely occur, you can plant pansies as perennials in the fall, when they'll bloom profusely for a month or two. If your winter is mild, pansy plants may stay green all winter long and might even flower in especially warm weather. In spring, the plants put out new growth and a new flush of flowers, restarting their cycle of growth. You can help prolong flowering for pansy plants by removing flowers when they fade. Called deadheading, this prevents the plants from producing seed and helps funnel their energy into making new flower buds. To deadhead, use your finger and thumb to pinch off fading flowers, removing each flower along with its stalk to keep things looking tidy. You can also use shears to deadhead, but wipe your blades with rubbing alcohol between cuts to prevent spreading plant disease. If pansies planted as annuals start to fail when summer heats up, trim stems back partway, leaving some foliage on each plant. Keep them well-watered during hot weather, aiming for at least 1 inch of water weekly, including rain; once cool fall weather arrives, plants may put out some new growth and set new buds for another, lesser round of flowers. Growing pansies in a spot that gets full sun for most of the day spurs top flower numbers; the plants can grow in partial shade, but this lessens blooming. 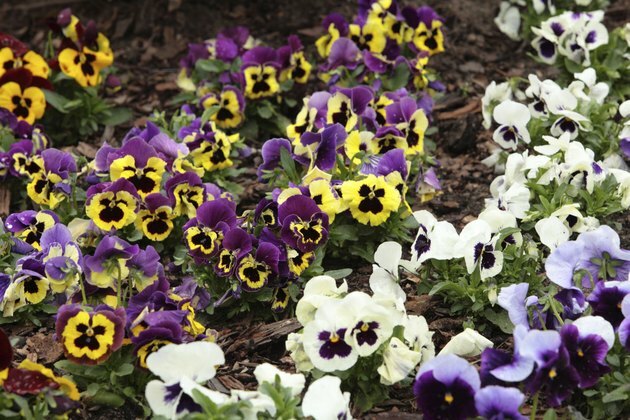 Some extra care during the growing season can also help maximize the number of flowers a pansy produces. Add 3 or 4 inches of organic mulch such as straw or shredded bark under each plant's canopy, keeping mulch back a bit from the plant's base to discourage fungus. Mulching helps keep roots cool while also conserving soil moisture and keeping down weeds that compete for water and soil nutrients. Many different pansy cultivars are available from nurseries and garden centers. They include a mixture called "Moulin Rouge," which included extra-large flowers with highly ruffled petals, and "Antique Shades," with old-fashioned flowers in soft, pastel shades. All varieties benefit from regular fertilizing during the growing season, which helps build sturdy plants with large numbers of big, brightly colored flowers. Use a granular, 5-10-5 formula, applying it every three weeks by mixing it gently into the soil around each plant. Use about 1/2 pound of fertilizer for 25 square feet of area planted with pansies and water the fertilizer in well.